Uncategorized – Page 12 – Disorderly Conduct. 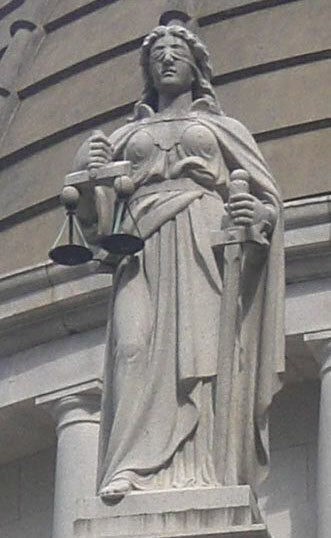 For 2011, I’m thinking that the Lady of Justice needs to be updated. I’m for getting rid of the blindfold, ditching the scales and actually just using the likeness of my Great Grandmother. Three guys are walking down the street and get confronted by a “victim.” One of the men in the group pulls out a gun. The other two in the group run away as the guy with the gun shoots. The victim is struck once but is not critically wounded. The shooter flees. A witness tells police he saw three white guys running down an alley away from the scene. That’s all the police have to go on. What should they do? What do they do? They do what they’ve been taught- start taking people into custody. Every guy in the area gets cuffed, put in a car, and locked up at the police station. Guys walking down the street. Guys at the 7-11. Even guys sitting at home, but who might be “the usual suspects”. Soon the police have three times as many people in custody as there were guys at the shooting. With at most 3 guys there, the police have to know most of the people in custody could not possibly have been involved, right. How is that fair? How would you feel if you were one of them? You would think that police arresting every white guy in the area with nothing else to connect them to a crime might be something to make the news. Who is going to tolerate the police locking up so many innocent people for no reason whatsoever? Minding your own business is probable cause for what crime, exactly? This stuff happens all the time. All the time. These facts are actually loosely based on a police report I recently read. And, it did make the paper. Not because the number of people taken into custody, though. The newspaper article (based on information released by the police, of course) talked about how two men were arrested and a warrant was issued for a third. It said nothing of the several other men who were bound with cuffs and caged like animals until the police decided they could leave. I have a theory on why that part wasn’t included. It’s not only because the police didn’t include it in their press release. It’s because the men were actually black. A big part of why I love this job is that I get to keep the police in check. When they do something I don’t like, I get to push back. It’s fun, but it’s also a difficult, uphill battle. Despite that, I keep at it. Mostly because I worry that someday I’m going to be the guy minding my own business but getting arrested for nothing. I have simple needs. The need to know I can walk down the street free to mind my own damn business without being arrested is one of them. My need to know the police won’t be breaking down the door at night while I sleep is another. So, it bothers me when other people walking down the street get “detained” for little reason. It seems to me that an extremely vague physical description of three guys (only one of whom actually harmed anybody) shouldn’t be enough to lock up every guy in the area. Yet, it happens. So much so in many communities that it isn’t even news. I know that if it happened in my neighborhood, it would be a fairly big deal. Especially if it happened over and over and over again. Let's get rid of this lady. Justice is supposed to be blind. You know those cliché scales that are on the business card and web page of every unimaginative law firm? Despite the fact that many law firms completely screw it up, those “scales of justice” are supposed to be equally level. The scales are actually being held by the Lady of Justice who has a sword in the other hand and is wearing a blindfold. The blindfold, obviously, is to symbolize that justice is blind. The equal scales are to show that justice is not only blind, but equal. In theory, anyway. For 2011, I’m thinking that the Lady of Justice needs to be updated. Freshened up a bit, if you will. I’m for getting rid of the blindfold, ditching the scales and actually just using the likeness of my Great Grandmother. While the Lady of Justice makes for great imagery (and her scales look swell on business cards), my Great Grandmother more accurately reflects reality. Why? American “Justice” isn’t blind. It’s also not equal. Like Grandma, it sees what it wants. Also, like Grandma, it’s at least a little bit racist. Now, before you go judging my poor, old, dead, Great Grandmother, it’s not like what you think. She never locked up some kid who was just walking down the street (minding his own business). She did not, however, trust Japanese people. You bomb Pearl Harbor, and Grandma is going to hold a grudge. For 45 years. With the unfortunate demise of Grandma in the late 80’s came the fortunate demise of the grudge, though. Nevertheless, a little bit racist is a little bit racist. It’s no better for Grandma than it is for the justice system. So, I nominate her as the new Lady of Justice. She would be flattered, really. Then we could put up “New Lady of Justice” statutes all over the place. They could serve as a reminder that people going for an evening stroll might just get you locked up…. and that it probably isn’t even out-of-the-ordinary enough to be news. Until then, I’ll just keep doing my best to push back. I just came across this page and love what I’ve read so far. Most of the criminal law stuff on the ‘net is fluff and marketing. Are you really getting “case updates” off of blogs instead of official pages? I didn’t think so. This guy is a straight shooter. I don’t know how to set up one of those bookmark things. I’m posting this so that I can always find the link. Soul Searching – Why do you let them search? Me: Ok. Then what happened? Accused: The officer asked if he could search. Me: What did you tell him? Accused: I told them he could. Me: Why did you tell him he could search if you thought there might be contraband in the car? Accused: I didn’t want to look guilty. You think politely telling the police they cannot search makes you look guilty? Know what really makes you look guilty? Standing on the side of the road in handcuffs while the police pull out 10 pounds of weed from your car. It’s not possible to look more guilty. That, of course, is the text of the Fourth Amendment. The drafters of the Bill of Rights didn’t think you would look guilty for refusing a search. So, to whom do you think you look guilty? The Police? Guess what? He already thinks you’re guilty, that’s why he wants to search. In many cases you have no ability to keep the government out of your life. In everything from how long your lawn may be to whether you may put a boat in the water without registration, you don’t really have a “right”. Unless there is a warrant, exigent circumstances, or some other exception, the Fourth Amendment says you do have a “right” when it comes to searches. Americans pitched British Tea in the harbor and then fought and died for the freedom to painstakingly draft and ratify the text of the Fourth Amendment. My experience is that people are a lot more willing to gloss that over in the face of a request from the local patrol officer. The next part of the conversation re-enacted above has me talking to the person about their specific case, and what they should have or could have done. I can’t give out general advice over the internet to cover each specific police interaction, so don’t even think about taking my musings here as advice for what you should do in your specific situation. Doing so would be silly in light of the fact that I do fee consultations, anyway. Just call me. The best general advice I could give out is that if you ever get asked by the police if they can perform a search, it would be wise to call a lawyer for advice. Right then and there. I will, however, say this. I have nothing illegal in my car. I have nothing illegal in my house. Plain and simple, I have nothing illegal. If the police ask me to search, though, my answer is “No”. I don’t care what they think of that. Author matthaidukPosted on September 19, 2011 October 15, 2011 Categories Police, Things I might do, UncategorizedLeave a comment on Soul Searching – Why do you let them search?